« Flacks will always try this on. Resist. David Lange once said, ‘He who lives by the quip, dies by the quip’. Sometimes Justice can be blonde. Judge David Harvey’s later pun about the United States being ‘the enemy’ in a discussion about the American push in the Trans Pacific Partnership ‘free trade’ talks to extend the copyright period to 70 years after the creator’s death and impose other moves has led today to him withdrawing from the Kim Dotcom extradition case. The reference to ‘the enemy’ was a play on words referencing the Walt Kelly quote ‘We have met the enemy and he is us’. It’s been interpreted by the simple, the gullible and Judge Harvey’s enemies as a POSSIBLE indicator of bias, hence his decision to withdraw. Better to stand aside than to offer scope for an appeal on such spectral grounds. Too bad. Judge Harvey was, arguably (and certainly in my opinion), our best-qualified jurist to deal with the case. But never mind. 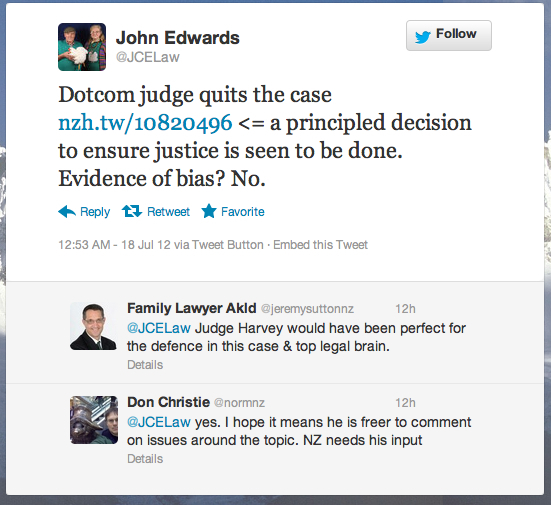 It seems plain Judge Harvey was being a bit of a wit, a raconteur, rather than displaying a lack of impartiality. Still, better safe than sorry. 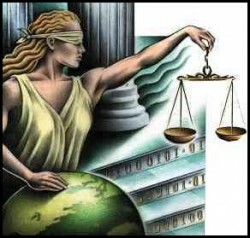 Justice has to be seen to be done.